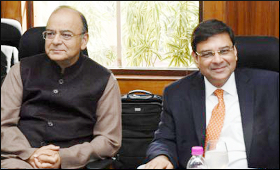 Finance Minister Arun Jaitley and Reserve Bank Governor Urjit Patel say that market forces will ultimately temper the protectionist tendencies emerging in the the US that may affect India. Speaking on Monday at two different venues here, they were both asked about the likely impact that protectionism in the US under President Donald Trump may have on India. Jaitley, who spoke at the Council on Foreign Relations, said Trump's policies on H1-B visas and trade are unlikely to have long lasting effects as market and economic forces will have a correcting effect. He said that he did not see any strains on India-US commercial ties lasting beyond the initial phase "for the reason that for economies to say that my companies must buy costlier material or my companies must hire costlier services, even when better alternatives are available eventually is not going to help the economy itself." He added, "And therefore, the very force of the economy and the market economy itself is capable of pulling in the other direction." Reserve Bank Governor Urjit Patel gave a similar prognosis after delivering the Kotak Family Distinguished Lecture at Columbia University. "The country that advocates protectionism is ultimately affected," he said. "The most efficient corporations in the world, including in the US, benefit (and) their share prices are where they are because of the global supply chain," Patel said. "Where would Apple be, where would Cisco be, where would IBM be if they were not sourcing the best products and talent from across the world?" Patel added. He ascribed the calls for protectionism in the US to income inequality and said they "should be addressed through domestic fiscal policies, in other words, taxation and income transfers." "Using trade instruments like customs duty, border tax, etc. is not the most efficient way. In fact could end up somewhere else." Trump, who ran for President on a platform of "Buy American, Hire American", has called for restricting the H1-B visas for professionals to higher-level technical positions paying higher wages and for bringing back manufacturing to the US. Jaitley said that relations between New Delhi and Washington have been built up over the last two-and-a-half decades and were strong enough to withstand temporary pressures. "It's a mature relationship, which has defied elections in India," he said. "It's defied elections in the U.S. itself. And I'm sure that, even under the new administration, that relationship is going to continue, and continue to improve."